After a fairly quick pace (quick for the World Series of Poker final table anyway) that saw the November Nine play down to just four players well before the dinner break the action slowed down a bit as Pius Heinz, Matt Giannetti, Ben Lamb, and Martin Staszko all had plenty of chips to work with and it seemed that whenever a player was at risk they managed to stave off elimination. The first player out the door was Sam Holden who entered the day as the short-stack, made a stand with AJ, only to have Ben Lamb wake-up with AK. Next to fall was another of the day’s short-stacks, Anton Makiievskyi. Makiievskyi’s elimination was far more brutal than Holden’s as the young Ukrainian got it all-in pre-flop with KQ against the 99 of Pius Heinz. A flop of KJJ seemed to be the big pot Makiievskyi needed… until a brutal 9 hit on the turn, sending him home in 8th place, and propelling Heinz toward the top of the chip counts (Heinz had previously picked off a bluff from Eoghan O’Dea to start his ascension). Not long after the elimination of Makiievskyi, Bob Bounhara hit the real after being grinded down to just 4 million chips. In one of the few questionable plays of the evening Bounhara went over the top of Martin Staszko’s opening raise (a bet Staszko is calling every time) with a mere A5. 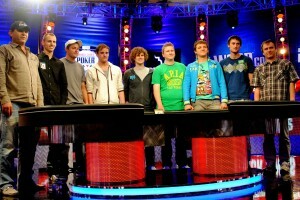 Staszko’s A9 held and the lone amateur was out in 7th place. This left Lamb, Staszko, Heinz, Matt Giannetti, Phil Collins, and O’Dea, and the six players put on quite a show, as big pots were won, chips changed hands, there were also numerous comebacks as players flirted with elimination. In a pivotal hand Ben Lamb and Eoghan O’Dea clashed with mid-sized stacks with Lamb coming out on top and crippling the young Irishman after hitting one of his many outs on the river. O’Dea would be eliminated moments later. O’Dea was followed out the door by Phil Collins, who had a rollercoaster ride of a day. Collins who seemed to jump between 30 million and 15 million chips all day, but his A7 couldn’t topple Pius Heinz’s pocket 9’s (even after a 456 flop and a turned flush draw gave Heinz the obligatory “Sweat”). The final player eliminated on Sunday was Matt Giannetti. Giannetti seemed to be cruising along all day, but a huge pot between he and Ben Lamb saw the two US pro’s fortunes change as Lamb’s A7s managed to Turn a flush against Giannetti’s pocket Jacks. Soon after Giannetti had a chance for some payback as he was holding A3 against the Pocket Kings of Lamb, but BEN LAMB RUNS GOOD, and hit quad kings on the flop! This entry was posted on Monday, November 7th, 2011 at 9:21 am and is filed under Poker News. You can follow any responses to this entry through the RSS 2.0 feed. You can leave a response, or trackback from your own site.